Chris Herring Heat & Air is proud to serve the Pontotoc community! About Pontotoc, MS - Happy to be your hometown Heating & Air Conditioning Contractor! The City of Pontotoc is located in Pontotoc County, Mississippi, and it serves as the county seat. As of 2010, the population had exceeded 5,600 residents. The name Pontotoc is a Native American word that translates to “Land of Hanging Grapes,” and the community gained some notoriety for being the hide out of the famous outlaw Jesse James. Pontotoc is served by the Pontotoc City School District, and both North and South Pontotoc High Schools are among the top academic schools in the entire state. The greater Pontotoc County has a population of nearly 30,000 residents, and it is part of the Tupelo Micropolitan Statistical Area. Both the original Natchez Trace and the modern Natchez Trace Parkway travel through the lower corner of the county. Parts of the Tombigbee National Forest also pass through the county, and it is designated as a national protected area. 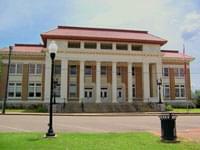 In terms of attractions, there are few located in the modestly sized community of Pontotoc. Outdoor recreation is popular in this city, and outdoor spaces include Algona City Park and Mubby Creek Park. There are other unique shopping destinations in the community, including Ella Ivy Boutique and Jim’s Lily Pad Florist. Larger attractions like the Tupelo Community Theatre and the North Mississippi Symphony Orchestra can be found in nearby Tupelo. Summers in Pontotoc can be quite uncomfortable without the use of an air conditioning system. Humidity levels are high, and temperatures can reach into the mid-80s in July. Since the summer weather is often a difficult time for allergy sufferers, an air conditioner is especially important, as these systems can improve indoor air quality by removing allergens and dust particles. Although winters in Pontotoc are generally milder than other parts of the U.S., dangerous weather conditions may still arise. Cold snaps with freezing temperatures can occur, and freezing rain and ice storms may make travel and driving hazardous. When these dangerous weather conditions arise, residents are thankful to have a well-serviced and reliable home heating system in place.